Fashion and Coffee - my kind of brew! And I'm happy to end my eventful year with this as the last event that I attended as a blogger. So glad that I was able to go to the Coffee Bean and Tea Leaf event. 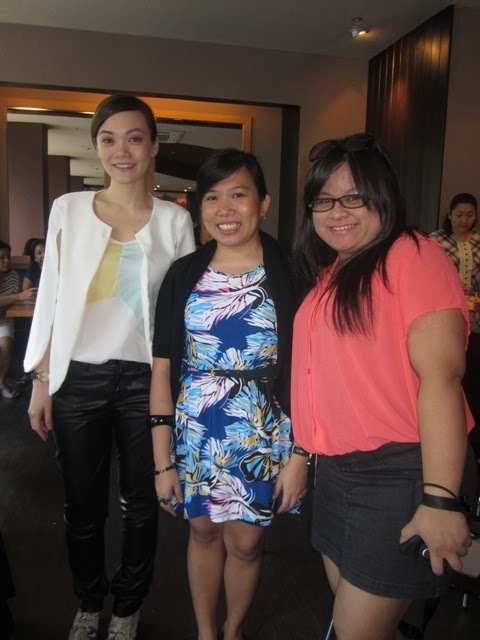 Many thanks to JEN who invited me to join her at The Coffee Bean and Tea Leaf's latest brunch series - Small Talks for Big Changes which featured Preview Magazine's Associate Editor, Eunice Lucero for its last leg and brought everyone up-to-speed with the latest from the Philippine fashion scene. "It's great that the Philippines is now being seen as a viable fashion capital,"shares Lucero. "The local fashion scene is growing, blooming - it's going global and trends are now becoming more concrete. Filipinos are now looking for comfortable clothes, more streamlined and very much stylish. In addition to this, many local designers are also making their mark in the international fashion scene like Michael Cinco and Kermit Tesoro." Then she went on to share the possible trends this Spring/Summer 2012. I know some people (especially bloggers!) have already started doing this trend and according to predictions, we will see more of that next year. As much as I would love to try out this trend, I can't coz of my day job. Hehe. So if you can sport this, kudos to you! As for hairstyles, how you part your hair matters! So its also predicted that parting your hair in the center and slicked-back hair will be in next season. Stained cheeks will be in! As for makeup, stained cheeks for spring and summer will be in! No more bronzers then huh? Flat bright lips will be in next summer! Don't forget to check out your favorite makeup brands to get your hands on one. And while you're at it, grab some white eye shadow as well just in case if you don't have one. I already just bought mine from NYX at Greenhills last week. Also mentioned in the talk, one of the trends that will definitely be in next year is the emphasis on clear beautiful skin -- especially the pores. So expect people to be more conscious to have pore-less skin. As for fashion trends, expect Laduree Pastels to be in. Hmmmm what do you think about color blocking in pastel? I became so engrossed in the talk that I forgot to take photos. LOL. Sorry. But the other fashion trends mentioned was sporty everyday wear, retro, and floral printed fabrics. After all, it is summer! After the talk, we were all given a chance to to ask for personal tips or ask about personal fashion dilemmas with Miss Eunice. I remember asking what will be the shoe trend next year and she mentioned BOOTS. Haha. That definitely curled my toes in glee! Of course throughout the course of the talk, we also enjoyed a cup of tea or coffee and some dainty treats and snacks courtesy of The Coffee Bean & Tea Leaf. Check out The Coffee Bean and Tea Leaf's new single-serve system, the CBTL! We all got to try out a drink from CBTL. The series is a part of the brand's Great Exchange program, an on-going trade-in event that highlights The Coffee Bean & Tea Leaf's new single-serve system, CBTL. Dubbed as the future for coffee and tea aficionados to enjoy more than 70 varieties of their favorite The Coffee Bean & Tea Leaf drink at the comfort of their own home, and with just a touch of a button. To have my very own CBTL without leaving home sounds pretty amazing! I tried out the Viennese Brew (mild) and it was lovely. And the fun part of the whole thing is that its so easy to use. *sigh* Can't afford to take one home but I wouldn't mind if Santa would drop me one on his way back to the North Pole! hehe! Also it was so nice to see and talk with other bloggers there! And that's a wrap with the last event I attended for 2011. I'm definitely looking forward to what's in store for us this 2012. I already have ideas on which trends I might be following next year. What about you dear coffeeholics? Think you'll be going for the two-toned hair next year? Let me know your picks! Hope you all having a wonderful holiday!